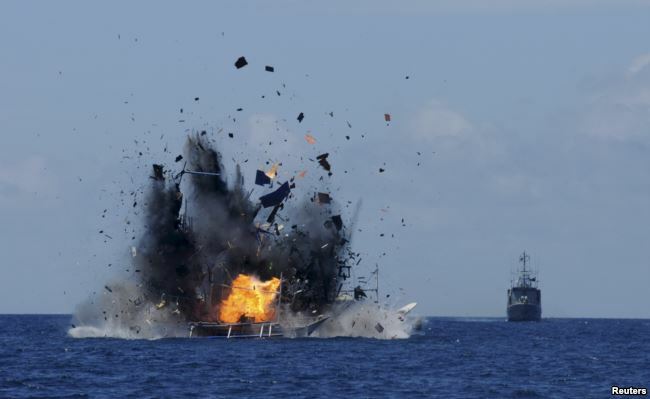 Indonesia and Malaysia are reminding foreigners of their often overlooked claims in the crowded, contested South China Sea by destroying foreign boats that take fish from waters near their coastlines. 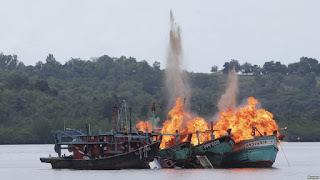 The Malaysian Maritime Enforcement Agency on Aug. 30 burned two foreign fishing boats as they floated on the sea, a change from the less visible practice of sinking them, media in Kuala Lumpur reported. Boat operators from China, Vietnam and the Philippines often slip into waters off the Malaysian north coast of Borneo. In Indonesia, where vessels from the same countries as well as Malaysia come uncomfortably close to shore, authorities have destroyed 317 fishing boats in President Joko Widodo’s term since October 2014. The graphic warnings should reverberate among fishing operators for now, giving both countries new attention to their maritime claims, analysts say. “Indonesia has been doing that and just this week I think we also heard the same from Malaysia, so it’s maybe just intimidation,” said Termsak Chalermpalanupap, political and security affairs fellow with the ISEAS Yusof Ishak Institute in Singapore. Fishing boats often follow fish regardless of other countries’ ocean exclusive economic zones (EEZs), South China Sea scholars say, while most Southeast Asian countries lack the fleets to stop every trawler slipping in. The boats do, however, use instruments to tell them where they’re trawling. It’s unclear whether Malaysia will make boat burning a new normal. The enforcement agency did not answer phone calls Friday, but officials quoted in the New Straits Times last month called the fires a warning for other vessels. The country’s Fisheries Department as referenced on the Bernama News Channel said Malaysia loses 980,000 tons of seafood worth up to 6 billion ringgit ($1.43 billion) to illegal fishing. Boats may use Malaysian waters because they can get bigger, higher-value fish such as groupers, Oh said. Chinese ships used to be spotted most often in other countries’ exclusive economic zones, said Jay Batongbacal, director of the Institute for Maritime Affairs and Law of the Sea at the University of the Philippines. But he said Vietnamese boats have grown more daring since 2010 as China edges them out of fishery tracts closer to their shores, such as around the Paracel Islands. In the Philippines, he said, people in the northernmost outlying islands once burned foreign boats “without official sanction” to make a statement. Now Filipinos turn up off Indonesia in pursuit of tuna and sometimes get captured there, he said. Indonesia, Malaysia and the Philippines lack coast guard power to turn away every foreign vessel that crosses into its exclusive economic zone, which extends 370 kilometers offshore, Batongbacal said. Countries struggle to keep foreign vessels away in some cases because six of the countries dispute sovereignty over the South China Sea, a 3.5 million-square-kilometer body of water known also for oil and gas reserves. The waters off Borneo are part of that sea. China and Taiwan, both with active fishing populations, claim almost the whole sea. Brunei, Malaysia, Vietnam and the Philippines claim parts of it. Fishing boat intrusions are unlikely to become a diplomatic issue, but the 10 members of the Association of Southeast Asian Nations (ASEAN) will tell their fishing operators to “respect neighbors,” Chalermpalanupap said. China, as the strongest claimant in the South China Sea, protects its fishing fleet against capture that could spark the burning of a boat, analysts believe. As part of China’s expansion of its control over the sea in the past decade, its coast guard vessels have been spotted escorting fishing boats into contested tracts of sea. Beijing has also used landfill to build up tiny islets for military infrastructure, some of which can support radar systems as well as combat aircraft. But fishing boats will keep testing the waters of weaker countries to go after big catches, Chalermpalanupap said.